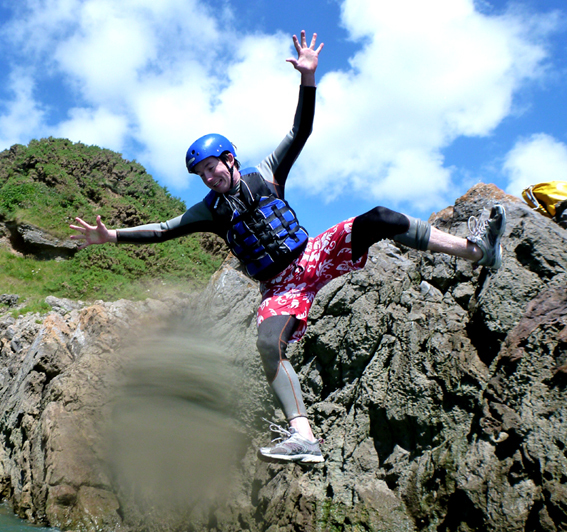 Coasteering Wales: The most exciting Coasteering Wales can offer is at Pembrokeshire, the Gower and Anglesey so try Coasteering Wales for an amazing coasteering experience. 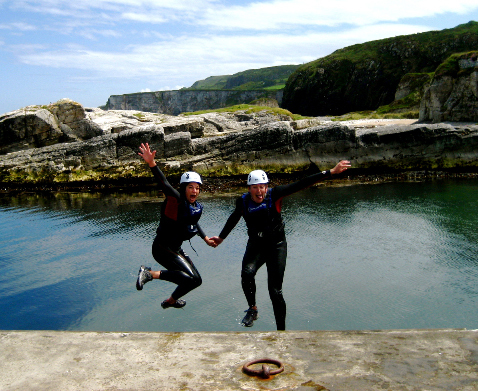 If you are looking for most exciting coasteering that Wales can offer then Coasteering Wales is the place to go. 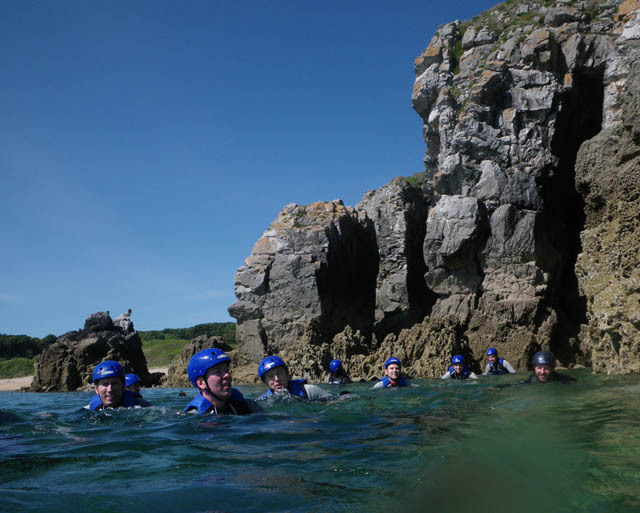 With some of the best instructors and equipment in the country we can take you and your group on a coasteering adventure with jumps, swims, crawls and climbing thrills to exceed all other activities. If you have never been coasteering in Wales before it is basically having fun in the surf and on the rocks with the most stunning Welsh coastline as a backdrop. You could be climbing slabs, swimming through sea caves, jumping into deep pools or scrambling and swimming your way around the coast. All you need are a pair of old trainers, some shorts and plenty of enthusiasm, we supply all the rest. 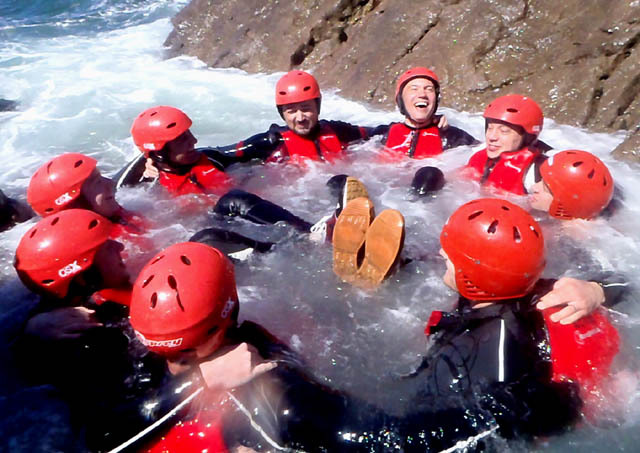 You will be kitted out with wetsuits, helmets and buoyancy aids and then taken to some of the best coasteering venues that Wales has to offer. 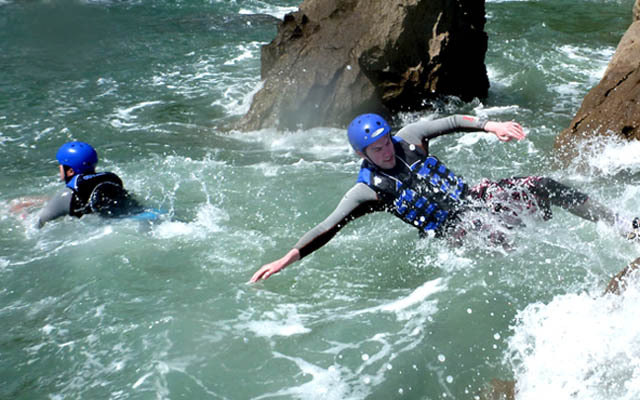 Even though coasteering in Wales is a hugely exciting outdoor activity, we aim to make it as safe as possible. 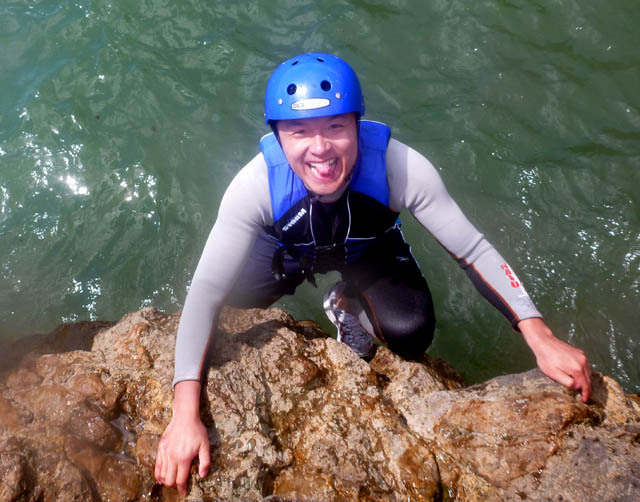 All the instructors at Coasteering Wales are highly experienced outdoor activity instructors as well as experts in coasteering. We hold regular training sessions and are constantly looking to improve our venues and routes. Our ultimate aim is to give you and your party the most fun, the most excitement and the best coasteering adventure that you have ever had. And don't feel intimidated by any photos or videos that you have seen, we always start gently and teach you all the coasteering techniques that you need along the way, so by the time you get to the longer swims and higher jumps you will be more than ready for them and if you feel that you don't want to do a certain challenge then there are always other options. 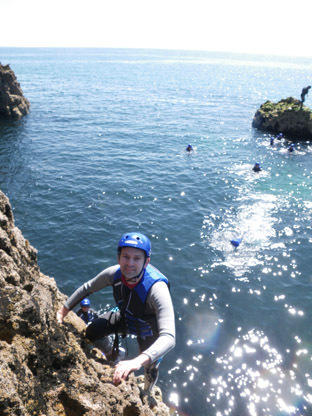 During the coasteering we will be taking photos and videos of you and your party at all the best spots. We will then send them all to your group organiser so that you can relive those moments again and again. If you want to bring your own cameras or camcorders we will use them when we can but it will be at your own risk. Don't forget, you can go coasteering in Wales at any time of the year as we supply full wet suits and all the necessary equipment to keep you warm and safe, all you need to bring are some trainers and a pair or shorts. So if you want to experience the best coasteering that Wales, Pembrokeshire, the Gower and Anglesey can offer then contact me for a quote for you and your party. I offer discounts for large groups and can arrange transport if you have not already got it organised. Finally if you are after some accommodation while you are coasteering in Wales then have a look at my accommodation page for great group and bunkhouse accommodation. Many thanks for such a great trip, organised so efficiently for 10 people, in school holidays, with 2 days notice! We all had a lot of fun, and Jeff was brilliant ... and very patient... when the teenagers wanted to do the jumps for the hundredth time! Highly recommended! 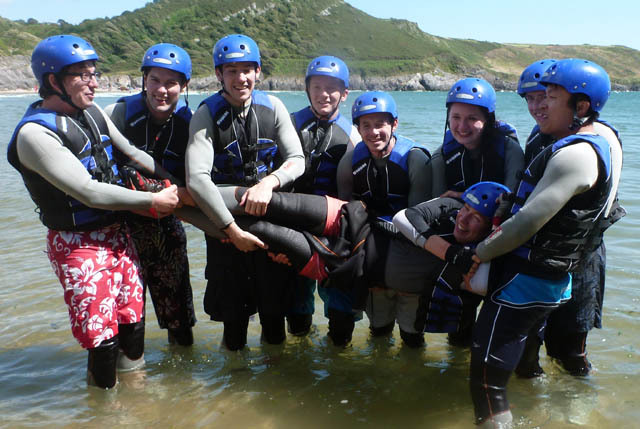 Coasteering was a great success, Tom & Paul @ Coasteeringwales were fantastic and made the whole group feel at ease. 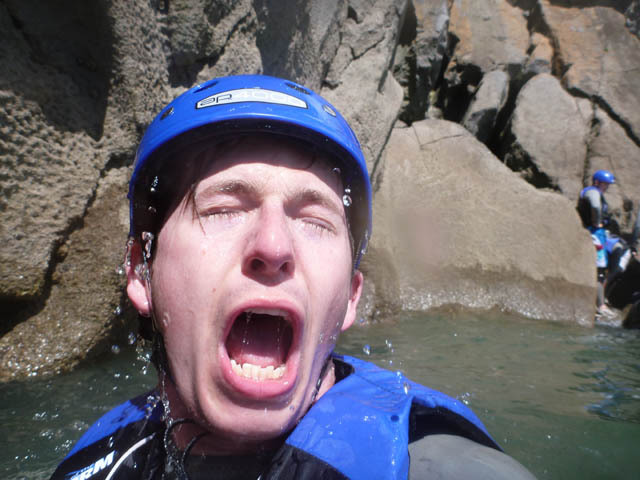 We all want to go coasteering again when the next stag do comes along. Thanks for your help. Amazin!! Thanks for a great Stag Day out in Wales, the lads thought it was amazing. Our thanks to the other instructors for their enthusiasm and humour. Hi Michael! 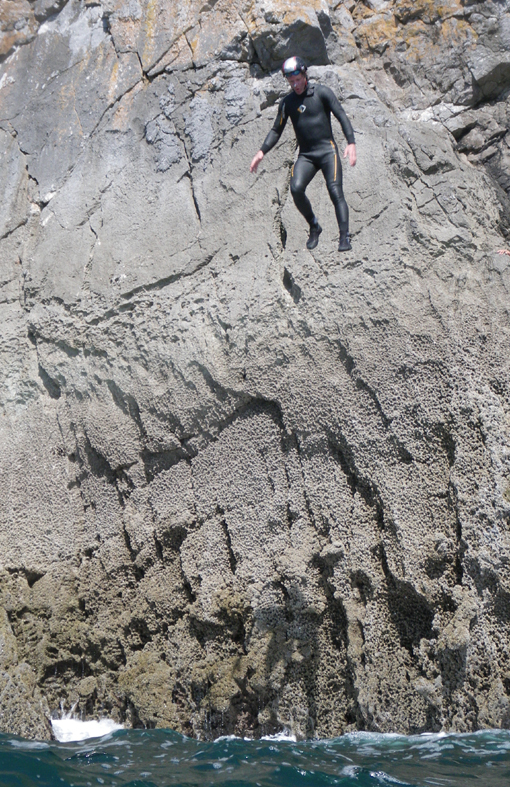 Just to say thanks again for the coasteering on the Gower on Saturday - everyone really enjoyed it. Although I think there were a few aches yesterday, and they weren't just down to hang overs!! My father is 60 this year and has always wanted to go coasteering so am looking at booking something for later this year. What's your availability like? Michael, Thanks for such a great day for my brothers stag weekend in Wales. The coasteering was everything I had hoped for, and I thought you and Matt were both great guides and great sports towards our whole group. All the boys were buzzing about it for the rest of the day! I may well be in touch about a gorge walking day (perhaps the one with abseiling). Also, thanks for capturing some great photos, and accommodating our varying group size. Stag weekends are difficult to organise, and I appreciated the flexibility in group size that you accounted for. I'll be sure to recommend coasteering and yourself to others! Hi Michael, Thanks a lot for a cracking day on Saturday. The lads had a great time and I couldn't have hoped for more with your company. Those photos are great, especially like the one of Rob smiling in the white water. Look forward to seeing the full set. Will send around to the team and get you some likes. I just wanted to say a big thank you to you and your colleagues for the fantastic coasteering day we enjoyed on Saturday. You were friendly and patient with us and we found it hugely challenging and rewarding. The whole party said they had a great time. Michael Many thanks for the mixed coasteering session we both thoroughly enjoyed ourselves and are now back at home (drying out!) It was a great experience and many thanks for all your help and guidance. Look forward to seeing the pictures! Hi Michael. A couple of bits and pieces: Firstly, Harry, Alex, Mike and I would like to thank you so much for giving us a terrific day coastering in Wales. We were all completely buzzing afterwards and felt it was one of the best, most fun, adventure days. The following day our surfing was cancelled as there was no surf but we all felt that the day spent with you more than made up for that disappointment so thank you. Michael, We all thoroughly enjoyed the day and were really impressed with the whole experience and your guidance. You will certainly be recommended to friends and family and I hope to arrange another trip in the future when the children are a bit older!! Many thanks for all your help. We had an absolutely fantastic time coasteering on Saturday it was good to meet you, Miv and Steve and thank you for your help and patience! I have already had 4 emails from the other girls saying how good the activities were and how much they enjoyed them.